Shifnal Cycling Society: Who Needs a Plan Anyway? This certainly wasn't part of the plan! I knew I was going to ride on Saturday morning but I really didn’t know where. Bike #1 had been cleaned and my intention was to keep it that way, for a while at least. So, it was looking like the Langster would be getting put through its paces. Over to Stafford for a teacake perhaps? A chance meeting changed things though, and after a sneaky post commute beer with the society’s resident Grimpeur, it was clear that all that cleaning was going to be in vain. 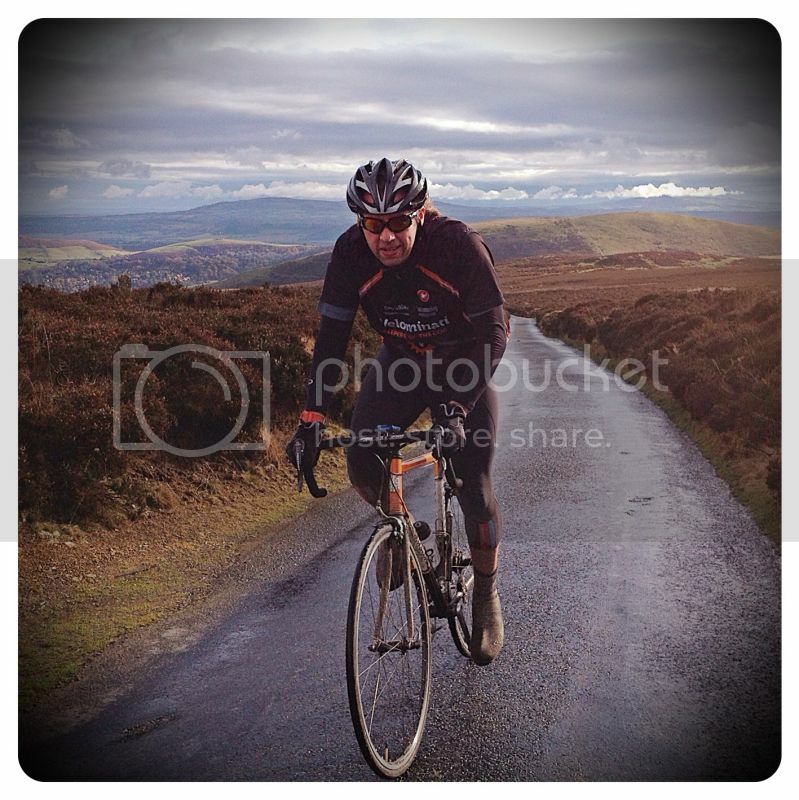 Hills, Hills, Hills was the battle cry, and our target was one particularly well known Landmark, The Long Mynd. I’ve blogged about this brute before, and I find it strange that it was only just over a year ago that I tackled it for the first time. In the meantime I’ve been over it a few times, perhaps most notable during the Velominati Shropshire Hills Cogal that we hosted in the Spring. This is a real rule #10 climb if ever there was one. Riding over to Church Stretton illustrates beautifully the differing nature of the northern and southern halves of Shropshire. Fast, flat plains in the north, and the 'Shropshills' in the south. Perhaps the perfect mix of cycling roads? I certainly think so. As we rolled along the eastern flank of the Mynd towards Church Stretton, the flat roads gave no indication of what lay literally, around the next corner. After a brief photo stop at the bottom of the ascent, it was time. Don’t be fooled by the relatively gentle start, and the road soon kicks up hard. With Johnny skipping away into the distance I settled into my own pace. The one bonus of the severity of the initial ramp is that in no time you’re rewarded by quite stunning views. As well as breathtaking(the little we had left!) vistas in every direction, luck seemed to be on our side, and the weather had also improved considerably. Even the sun was shining for us! The gradient eases as you ride up and over the shoulder of the hill and onto the quite vast plateau that houses amongst other thing a glider club! After some more pictures, it was time to drop off the Western side of the Hill towards Ratlinghope. Our plan was to return via Shrewsbury to the North via Pulverbatch and Longden. This is a real rollercoaster of a road. Short sharp climbs punctuating a long and gentle run off back towards the flatter, northern half of the county. The whole of the Shropshire and Cheshire plains were laid before us as we descended, and to the East almost like a homing beacon, sat The Wrekin. After a well earned coffee stop in Shrewsbury, it was time to retrace our steps back through Atcham towards base. The hills clearly hadn’t got the better of Johnny though and it was all I could do to hang on to his wheel along the Atcham TT road. The final climb over Snedshill, known locally as Aldi D’Huez, really caused me problems as the day’s climbing took its toll. 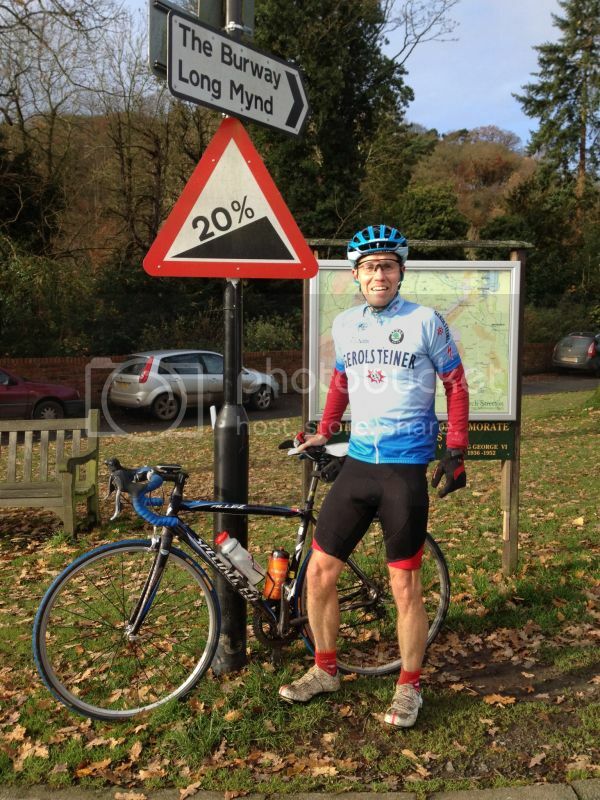 This last challenge over, it was time for the final descent down into Shifnal. A truly memorable ride, and all the better for the lack of a plan. Twas a great ride and an equally exceptional account. Particularly like the term "Le grimpeur : a climber. Also an obsessive compulsive human being who only talks about where he climbed last weekend and where he'll be climbing the next".